Since the Korean government mandated public entities to adopt Enterprise Architecture (EA) in 2005, 75.8% of central agencies, municipal governments, and other public organizations have adopted EA. Following a two-year project, which defined all government-level architecture components and collected relevant data from each agency’s EA, the Korean Government-Wide EA (KGEA) was rolled out. As of the end of 2010, KGEA manages IT projects, information systems, work processes, data, hardware, and other related information of 809 agencies in a single repository. All information is shared with all the agencies through the KGEA portal (www.geap.or.kr). This chapter illustrates a case of how EA works for aligning an agency’s IT resources with the national IT agenda and enhances IT investment management at a government-wide level. By applying the analytical framework suggested by Janssen and Hjort-Madsen (2007), the development and accomplishments of KGEA are then discussed in terms of connected government—specifically national IT investment and resource management, public service improvements, and interoperability across agencies. 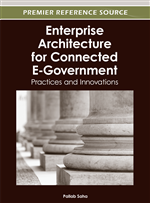 This case may offer practical guidance to government CIOs of other countries when implementing Government-Wide EA (GEA). Previous case studies on EA were mostly conducted at the organizational level with an interpretative approach and ad-hoc analysis (i.e. Armour, et al., 2003; Hjort-Madsen, 2006; Pulkkinen, 2006). However, an analytical framework which is well-suited for the analysis on the government level is needed because of the dynamic regulatory characteristics of the public sector. The seminal study on the government-level EA case was conducted by Janssen and Hjort-Madsen (2007). They developed an analytic framework based on the institutional theory (Scott, 1995) in order to provide insights into institutional aspects such as policies, actors, frameworks, principles standards, and implementations. The framework was used to compare GEA cases in Denmark and the Netherlands, and later was also used by the Finnish government to assess the EA maturity level of different countries (Liimataine, et al., 2007).